Last night, my sister, mother, and I attended an unschooling meeting. It was advertised as an unschooling meeting, but really what the woman who's organizing it wants is to start a democratic "school". The building she's renting is GORGEOUS! The main floor is one large open room (with bathrooms and an office coming off of it), with a large open upstairs room (with a curtain drawn across one end of the room to create a meditation area) as well as a dugout basement (the building itself used to be a house, and must be about 100 years old). A few years ago it was renovated, and now the floors, walls, and ceilings are all a beautiful honey coloured wood. If you haven't guessed, I love this place! Marilyn (the woman who's starting this thing) is interested in this place mainly being used by teens, both unschooled, homeschooled, high school rise outs, and teens who are currently in school, but interested in doing more or finding out more about unschooling. The "school" will be run entirely be the teens, with all decisions (finance, projects, workshops, classes, which adults/parents are invited to work with the teens and kids...) based on consensus decision making. Although it's basically starting with high school aged kids in mind, the plan is be welcoming of both younger children and cegep (college) aged people. Pretty cool, eh? The space will also be used for unschooling parent support groups, activities and play groups for the younger ones, and possibly as a space for teens to run businesses out of. Last night only a small group showed up, and Emi and I were the only teens, but there's going to be a meeting just for the teens interested in running this place soon. This whole project is very exciting! 1. WHOA, that sounds so awesome! Can I join even though I live in a differint country? Hehe, kidding! I wish, though.... You better keep us posted about how it all comes along! 2. Oh, I so wish I could friend you on facebook! My parentels would have a cow. Wow sounds like a cool project! 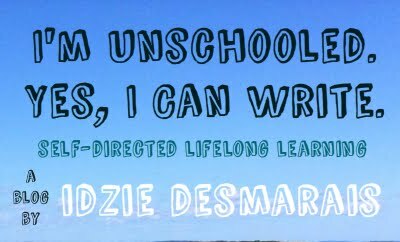 Starting an unschooling group in our area!